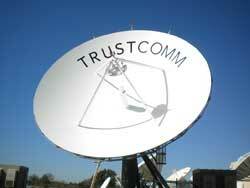 Review of TrustComm: A US based satellite communications service provider. Review of TrustComm Global Communications Inc.
Key feature: Large secure teleport at military facility in Texas, USA. TrustComm is a communications service provider, operating from a secure satellite teleport located within a military facility at Ellington Joint Reserve Base in Houston, Texas, USA. Their Network Operations Center is a high-tech, state-of-the-art facility opened in 2003. 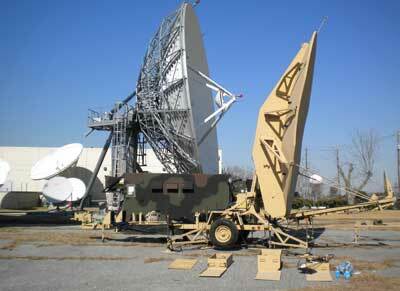 They provide VSAT, terrestrial, network operations and hub collocation services. The TrustComm teleport includes � among its antenna assets, a total of 12 antenna systems from 13m downward, operating in C, Ku and X-band. The systems are fully integrated into both AT&T and Abovenet redundant optic fiber rings assuring successful connection to virtually any network for Internet, data and voice backhaul. From their teleport they have a clear view of the southern skies with visibility of satellites above both the Pacific, as far as 193 deg east, and over Atlantic Ocean Regions, as far as 22 deg west, implying potential direct satellite hop connections to the Pacific, to the entire USA including Alaska, the Gulf of Mexico and South America plus Western Europe and Africa. Two example satellite beam coverage patterns are shown on the right, for AMC at 103 deg west orbit position and Amazonas at 61 deg west orbit position. These two satellites provide for connectivity in the coverage areas shown. Using other antennas, the teleport can access all geostationary satellites located between 22 degrees West to 193 degrees East, providing excellent coverage over much of the world from this single secure location. TrustComm was been named Teleport Operator of the Year and Fastest Growing Teleport by the prestigious World Teleport Association, as well as being the recipient of the US National Guard�s highly coveted Minuteman Award. Amazonas beam coverage of North and South America plus transatlantic connectivity into Spain and Europe. Satellite location 61 deg west. One of Trustcomm's large teleport hub antennas. Teleport view with trailer mounted dish in foreground. The images and text above are based on information provided by TrustComm Global Communications Inc. and are used here with their kind permission. This is not a paid for advertisement.